Palm Treo Hard Case is a sturdy and stylish hard case that is made from polycarbonate, and so it’s sleek and smooth with a luxurious finish. Palm Treo Hard Case is durable outside, and the soft interior lining pads protects and cushion the Palm Treo smartphone inside the case. The case comes with a removable metal belt clip and can be attached horizontally to your belt. 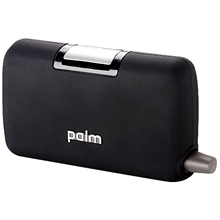 PalmInfocenter reviews the Palm Treo Hard Case and gives the hard case rating of 2.5 out of possible 5, and concludes that “if this case is kept closed most of the time and if your pockets are big enough to accommodate it and if you don’t mind using two hands at all times to do any action involving opening, closing or handling the Treo then you might enjoy this product. Otherwise, unless you’re looking for a solid case that’s smaller than an Otterbox and/or are very active in the course of a workday I’d recommend another style of Treo case. There are simply too many compromises here to be worth $40.